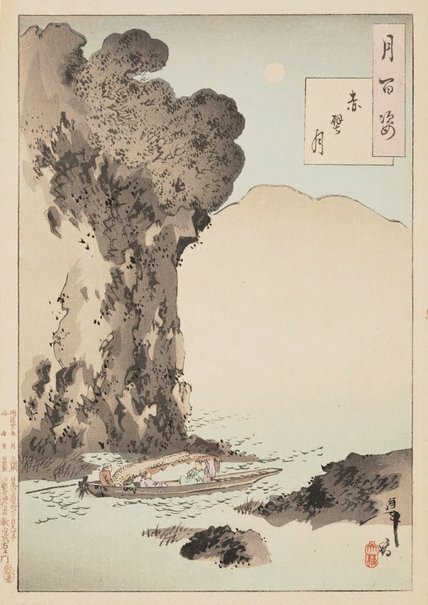 In 1082, Song dynasty official, poet and painter Su Dongpo (also known as Su Shi) went with friends to enjoy the full moon on a boating trip to Red Cliffs on the Yangzi River. There his guests, surrounded by the grandeur of the landscape, reminisced, wrote poetry and played the flute. This motif was popular in China during the Ming dynasty (1369–1644) and activities such as picnics and poetry parties were adopted during the Edo period in Japan by 'bunjin' (literati) who recognised their debt to the Chinese literati school of painters from the period.